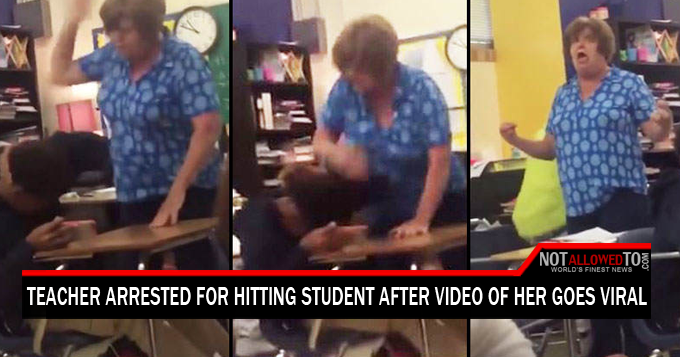 TEXAS | A teacher has been arrested for repeatedly hitting a student over the head, after a video of her went viral on facebook. Reportedly, the teacher has been identified as Mary Hastings from Ozen High School in Beaumont. In a 9-second video, she was caught slapping a student five times after what looks like an apparent disruption in the classroom. She can also be heard calling the student an “Idiot a**” before mocking him in front of other students. The teacher has been arrested and charged with one count of misdemeanour assault. She was taken to Jefferson County Jail and released on a $2,500 bond. The School released a statement saying that the teacher was immediately removed from the classroom and placed on administrative leave pending an ongoing investigation.